Jennifer Ouellette never took math in college, mostly because she-like most people-assumed that she wouldn't need it in real life. But then the English-major-turned-award-winning-science-writer had a change of heart and decided to revisit the equations and formulas that had haunted her for years. The Calculus Diaries is the fun and fascinating account of her year spent confronting her math phobia head on. With wit and verve, Ouellette shows how she learned to apply calculus to everything from gas mileage to dieting, from the rides at Disneyland to shooting craps in Vegas-proving that even the mathematically challenged can learn the fundamentals of the universal language. Jennifer Ouellette is a science journalist and the author of several books, including The Calculus Diaries, The Physics of the Buffyverse, and Black Bodies and Quantum Cats. Her work has appeared in the Washington Post, Discover, Salon, and Nature, among other publications. She writes a science and culture blog called Cocktail Party Physics on the Scientific American website. Ouellette served from 2008 to 2010 as the director of the Science and Entertainment Exchange, a program of the National Academy of Sciences that aims to foster creative collaborations between scientists and entertainment-industry professionals. She has also been the journalist in residence at the Kavli Institute of Theoretical Physics in Santa Barbara and an instructor at the Santa Fe Science Writing Workshop. Ouellette holds a black belt in jujitsu and lives in Los Angeles with her husband, Caltech physicist Sean Carroll. "If, like me, you love the neatness of calculus but never appreciated its applications or the colourful characters who have used it through history, then these diaries are well worth a read." 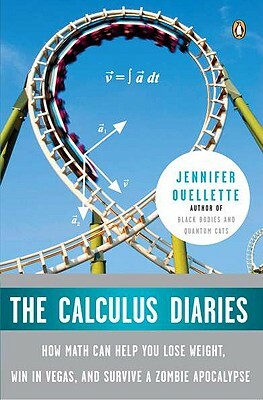 "In The Calculus Diaries, science writer Jennifer Ouellette makes maths palatable using a mix of humour, anecdote and enticing facts...Using everyday examples, such as petrol mileage and fairground rides, Ouellette makes even complex ideas such as calculus and probability appealing." "This dash through a daunting discipline bursts with wry wit. Ouellette uses differential equations to model the spread of zombies, and derivatives to craft the perfect diet. Sassy throughout, she reserves special barbs for subprime mortgage holders: "Chances are they weren't doing the math." "The Calculus Diaries is a great primer for anyone who needs to get over their heebie-jeebies about an upcoming calculus class, or for anyone who's ever wondered how calculus fits into everyday life and wants to be entertained, too!" "I haven't had this much fun learning math since I watched The Count on 'Sesame Street' when I was three. And the Count never talked about log flumes or zombies. So The Calculus Diaries wins the day." "Zombies? Surfing? Gambling? Nobody told me calculus could be like this. To my twelfth-grade math teacher: I demand a do-over!" "Back in the day, when I was close to flunking out of calculus class because I couldn't understand why it was worth my valuable time to actually understand it, I needed someone like Jennifer Ouellette to gently explain how I wrong I was. She's like every English major's dream math teacher: funny, smart, infected with communicable enthusiasm, and she can rock a Buffy reference. In this book, she hastens the day when more people are familiar with an integral function than with Justin Bieber." "In this wonderful and compulsively readable book, Jennifer Ouellette finds the signature of mathematics -- and especially calculus, of course -- in the most unexpected places, the gorgeously lunatic architecture of Spain's Antonio Gaudi, the shimmering arc of waves on a beach. Just following her on the journey is the half the fun. But the other half is learning about the natural beauty and elegance of calculations. Ouellette's ever clear and always stimulating voice is a perfect match to the subject - and The Calculus Diaries is a tour de force." "As amusing as it is enlightening, The Calculus Diaries is no dry survey of abstractions. It's a guide to everyday life -- to car trips and roller- coaster rides, diet and exercise, mortgages and the housing bubble, even social networking. As Ouellette modestly recounts her own learning curve, she and her husband become characters alongside eccentrics such as Newton and Gaudi and William the Conqueror. Like a great dance teacher, Ouellette steers us so gently we think we're gliding along on our own." "Jennifer Ouellette's calculus confessional is a delight, and an example of the finest kind of science writing. Her book reveals to its readers the gritty inner workings of the most important idea humans have ever thought. (Yes, calculus is that big: it's all about understanding how things change in space and time, and there just isn't much more important than that.) Ouellette's wit, her elegant wielding of metaphor, and her passion for both math and funky culture produce this crucial insight: every equation tells a story, she says, and she's right, and the tales she tells here will captivate even the most math-phobic." "Like the movies Batman Begins, Spider-Man, or Superman, The Calculus Diaries is the story of how an insightful, creative, and hard-working young person acquires superpowers and uses them for the benefit of society. Only this tale is true: Jennifer Ouellette can't fly or spin a web, but she can spin a yarn. The Calculus Diaries documents the author's seduction by mathematics and her conquering of it--Eureka!--to see the world with sharper vision. For too many people math, calculus in particular, is an albatross. But Ouellette reveals math for what it is, a powerful tool for solving problems and the exquisite language we use to describe nature. Reading this book will make you smarter. And more powerful." "If you ever thought that math was useless, read this book. Want to survive a zombie attack? Win at craps? Beat a zombie at craps? Well, listen to Jennifer Ouellette. The math she describes might just be your best hope if you don't want your brains to be gobbled by the undead." "A charming and gentle introduction to important mathematical concepts and their relevance to everyday life."